Stay informed on the latest health-related news and be alerted to opportunities to take action to protect natural health! The Pulse of Natural Health newsletter is delivered to your email inbox every Tuesday. Please consider providing your street address. Providing your street address allows us to contact you about legislative issues specific to your district. We will never sell your address, and we will only send you mail if you give us your permission first. 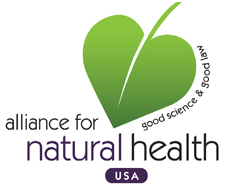 If you respond and have not already registered, you will receive periodic updates and communications from Alliance for Natural Health USA.